Sussex Sharks enter the final week of the Vitality Blast group stage knowing three wins from their last three will guarantee them a place in the last eight. The first of those fixtures takes place on Tuesday night (6.30pm start) when fellow qualification hunters Glamorgan visit The 1st Central County Ground. The match is part of a double-header with the Kia Super League fixture between Southern Vipers and Surrey Stars earlier in the day (full details below). After the frustration of two abandonments on Thursday and Friday night, Sussex find themselves in sixth place in the south group on twelve points from eleven matches. Crucially, they have a game in hand over the three sides ahead of them that are also hunting one of the two remaining quarter-final berths. Kent are four points ahead of the Sharks in third, Glamorgan are three points ahead in fourth and Surrey are level on points in fifth. All three sides currently have a superior run-rate to Sussex, but this will not be a factor if the team win tomorrow, on Thursday away at Gloucestershire and on Friday back at home against Middlesex. Head coach Jason Gillespie said: “We’re taking each game as it comes, knowing that if we do our jobs and execute our plans then the rest will look after itself. We’ll go into this week’s matches with the same mindset and attitude as we have done throughout the tournament. There is one change to the Sharks squad with Harry Finch replacing captain Luke Wright in the 14-man group. Luke has been ruled out for tomorrow’s match after experiencing acute lower back pain during training on Monday. Danny Briggs will captain the side in his absence. After a mixed start to the tournament, which included defeat to Sussex at Sophia Gardens, Glamorgan then went on a superb run, winning five consecutive matches to put them very much in contention for a quarter-final berth. 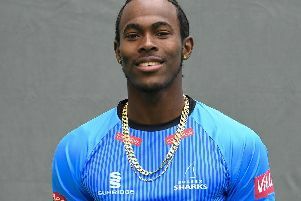 They encountered a bump in the road to Finals Day on Sunday, however, losing to south group leaders Somerset by 29 runs. The Welshmen’s captain, Colin Ingram, has once again been their main force with the bat, scoring 406 runs from his nine innings a return that puts him eighth in the tournament run-scorers list. Timm van der Gugten has been the side’s most dangerous bowler. In the south group, only Jamie Overton of Somerset has more than his 18 wickets. The Dutchman has been expensive, however. His right-arm seam costing nearly ten runs per over.